What caused me to pause in my initial response was that I agree with Adam on the importance of building diverse opportunity learning environments. 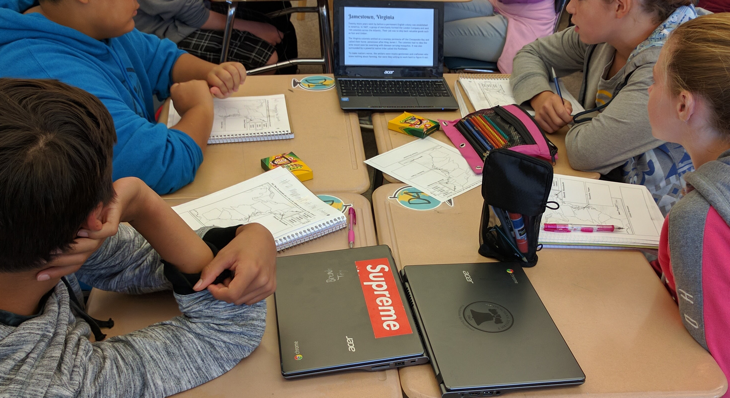 Many valuable learning activities in class do not require every student to have access to their own device and we should be providing opportunities for students to have a variety of technology tools embedded into the learning. But I also believe that providing every student with an internet connected device must be a fundamental educational tenet given how we access information today. That doesn’t mean that kids should be on the devices all the time, but their device should be available to access information when and where needed. I think it’s too soon to stop advocating for 1:1 as not everyone is there yet. Not going 1:1 limits options for learning. A whole class collaborative essay with real time teacher feedback is hard to do without 1:1. Blended learning is hard to do without 1:1. Flipped learning is hard to do without 1:1. Real time classroom assessment with data capture is hard to do without 1:1. The crux of Adam’s argument really revolves around funding. Fund 1:1 or fund 1:2 or 1:4 with Spheros, 3D Printers and other collaborative tools added to the classroom. Funding is a real issue for us in CA, since we have no dedicated funding source for technology and priorities are set by individual districts. Unfortunately, 1:1 is still seen in many districts as beyond their reach. This is where I struggle with what Adam was saying; if a district can afford 1:1 and chooses not to go that route, then I think they are constraining what I consider to be a foundational element of the modern learning environment. Another reality to consider is state online adaptive testing. We call it the CAASPP here in California. Every 3rd-8th grade student needs to feel comfortable and confident with navigating their device, accessing information and responding to assessment questions online. This is infinitely harder if students don’t have access to their own device. Spheros and 3D Printers are cool. I think things like Spheros, LittleBits, 3D Printers, Lego Robotics, Drones and their like are the modern day equivalent of the Computer Lab. We should be providing students access to these experiences. But right now, these tools are still relatively expensive, specialized tech that require a lot of care and feeding (support and technical know how) just like the Computer Labs of old. There are definitely times when being in a 1:2 or 1:4 device to student based activity is better suited to the learning objective. Classrooms should have multiple types of devices for learning, especially for Multi-Media projects. On this, I totally agree with Adam, but we shouldn’t compromise on a base line expectation of 1:1. An Internet connected device for every student is the “textbook required” equivalent for the 21st Century. Thankfully, the devices can do so much more than just access information and it’s our job as educators to make sure they are used for more than electronic versions of worksheets and textbooks. This disruptive path we are on in education will continue. Fundamentally, how we access information has changed. Constraining access to information in a classroom does not help students learn how to successfully navigate a world of abundant information. Until classroom devices are as ubiquitous as textbooks, paper and pencils, we can’t let go of the goal of ensuring every kid has access to an Internet connected device for learning. Perhaps you are too benevolent to schoolsand the funding process for tech. California’s limited money stream should be encouraging creative solutions. Instead, I see only a general spirit of throwing up our hands since nothing we do as teachers or as a school is seen as making a difference. This leads to a “don’t rock the boat attitude”. Secondarily, some of the same money that goes for salaries would/does go for technology so there is a disincentive for teachers to advocate for tech spending since it means more work for teachers to adapt to new tech and less pay at the end of the month.